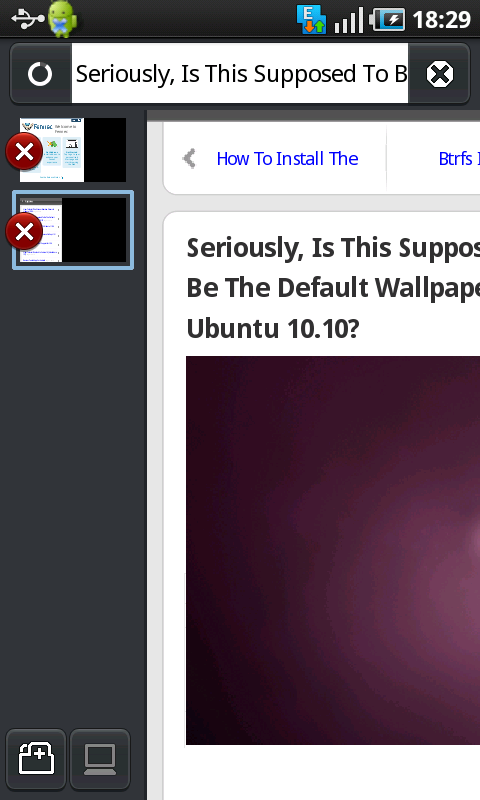 In case you do not know, Firefox is also making a browser for mobile devices. It is codenamed Fennec for now and the alpha currently available for Android and the Nokia N900. It had been available in the Nokia N900 for sometime but for Android it was released just a few days back. 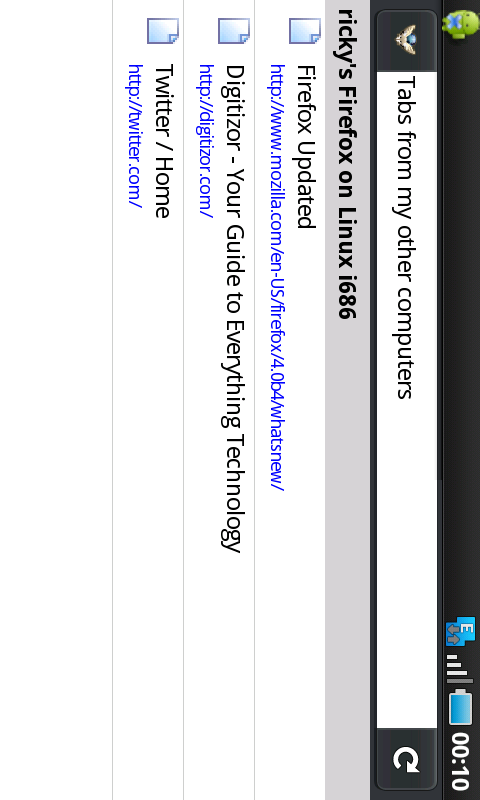 I am very satisfied with the stock Android browser. 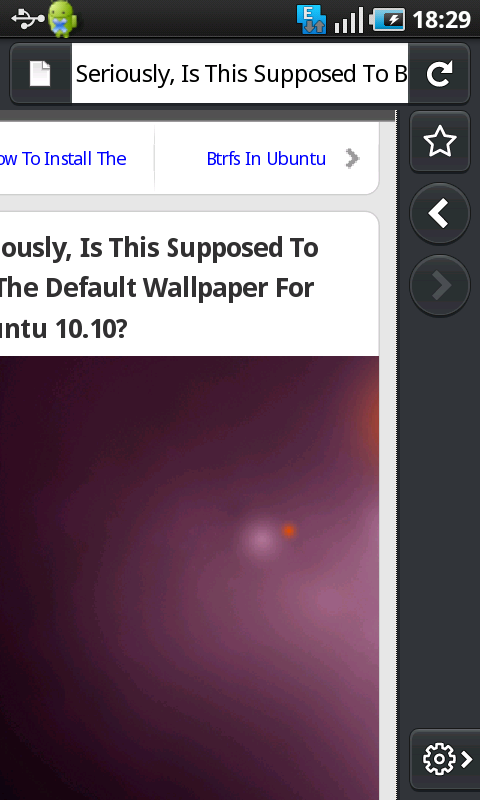 I even prefer it over Opera Mini. So, when I heard of Fennec being available for Android, I was excited no doubt, but I did not expect too much from it either. However, after using it for one day, I admit that it is brilliant. Yes, it is an alpha and it seems sluggish at times and takes a long time to start but what I am most excited about are the features it brings. Let us take a look one by one. This is the screen you see when you start Fennec for the first time. 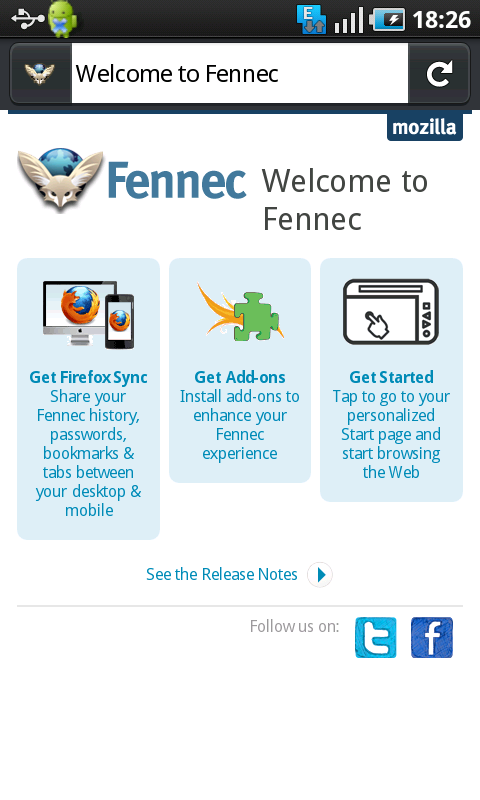 It introduces you to two very exciting features in Fennec - Add-ons and Sync. 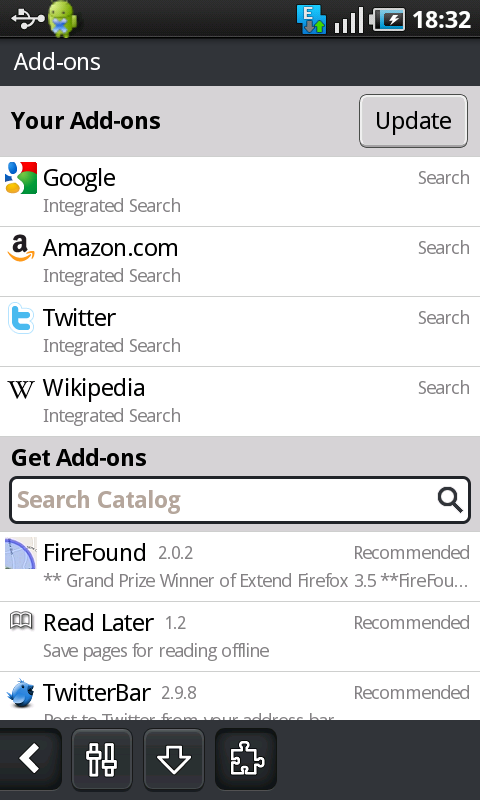 Yes, Mozilla has freaking brought add-ons to a mobile browser! And the sync feature is also a very exciting feature. We will come to these later. 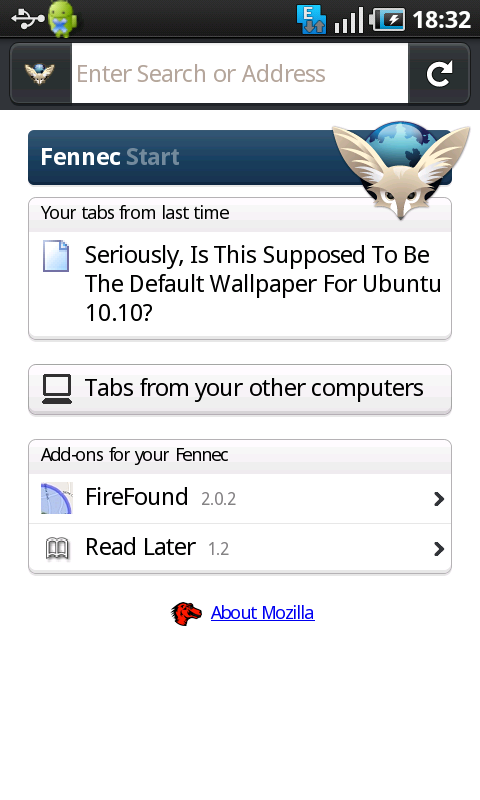 To access tabs, settings and other controls, Fennec has a rather ingenious solution. In the stock Android browser, you have to access those from the menu. With Fennec, however, it is different. Swipe your finger to the right, and you get the tabs side panel. At the bottom of the panel are the Bookmarks and Remote Tabs button. After you have synced your device, you can open the opened tabs in your other device (say laptop/desktop) from Fennec. The book marks are also synced by default. And when you swipe your finger to the left, you get the right panel. It has a bookmark button, back and forward. At the bottom is the settings. Clicking on the settings button brings you to the settings page. Nothing interesting here. It has all the settings options anyone would expect to see. You have to enter your Sync username, password and the Secret Phrase here to set up sync with your desktop or with other devices. The four buttons at the bottom are for back, settings (which is currently on the screen), downloads and Add-ons. As we have said before, Fennec supports add-ons. This is probably the first Android browser to support Add-ons. (Correct me if i am wrong.) By default, four add-ons are installed. There are plenty of others available from which you can choose. So, where does this leave Fennec? Right now, it is an alpha so, it would be stupid to criticize its slow startup and slight sluggishness. However, the features that it is bringing makes it a very strong contender to be the best browser on Android. Its navigation system using side panels is a pleasure to use. The presence of Add-ons is also sure to boost its adoption once it reaches a stable release. And we cannot forget Sync too. It will help you transfer your desktop browsing experience to your mobile device - well to a certain extent atleast. If you want to install it in your Android device, go to http://www.mozilla.com/en-US/m/alpha from your device and install it.